Next week, BLM will begin the largest removal operations of the Pryor Mountain wild horses to occur in over a decade and as usual, they have cited the current population of roughly 200 wild horses as causing “range deterioration, soil erosion and simultaneously being in danger of “starving” in the future”, to paraphrase their basic reasoning - despite current reports of thriving, healthy horses found throughout the area. Of course, BLM also leans on the “allowable” non-genetically viable population level set by authorized officers acting as representatives for Obama’s “CHANGE”: our completely unresponsive Secretary of the Interior, Ken Salazar and recently appointed BLM Director, Bob Abbey, who has already been found passing the public protest buck right back to the Montana Field Office leading the charge against both the general citizenry and our federally protected wild horses. Over the months leading up to what BLM continues to cite as the inevitable culling of the Pryor Mountain herd, I have been reading a wide variety of subject matter regarding the BLM's analysis, documents and even some history of the most famous herd in America. As a result, I thought a quick trivia question was in order as we continue to barrel down the culling of Cloud and his newly scheduled life as a "Sale Authority" commodity. Is it from BLMs current proposal? Or is it from something perhaps a little older…. While it seems like it's a darn close reproduction of what is being said today, these excerpts were actually taken from the oldest and most famous wild horse book ever written, “America’s Last Wild Horses” by Hope Ryden, Chapter 30. The Pryor Mountain Controversy, first published in 1970. To read through it today is a surreal adventure as both past and current events blur into one time line, making it hard to distinguish between “then” and “now” as BLM continues to use the exact same excuses and justifications to continue the assault on this ancient herd - just as they did in 1968. Reading through The Pryor Mountain Controversy, Ms. Ryden expertly recounts all the politics, events and public involvement that led to the Secretary of the Interior finally declaring the Pryor Mountain wild horses and their habitat as a “legally protected wild horse range” – before the Wild Free-Roaming Horse and Burro Act had even been drafted in the halls of Congress. The history of how these amazing animals finally became protected is one of high drama, multiple intrigues and political persuasions from every camp, both local and national, and well worth the read. While I was actually dumbfounded by many of the politics being played out (merely because absolutely nothing seems to have changed! ), complete with a cast of the usual suspects, Montana’s Livestock Association and Montana’s Fish & Game Department, who adamantly claimed the Pryor Mountain wild horses were responsible for declining mule deer population in the area (with a plan already in the works to replace the Pryor horses with bighorn sheep), what struck me as most significant was how the truth was exposed regarding claims of deteriorating range conditions and soil erosion being caused by the 200 wild horses in the area. It would seem that, while “deteriorated range conditions” was an actual fact, a special Committee comprised of appointees hand picked by DOI Secretary Udall himself and assembled to study the feasibilility of preserving the Pryor Mountain wild horses found that, the degradation had actually occurred some 50-100 years earlier due to domestic sheep grazing. Furthermore, the thriving, healthy wild horse populations of yesteryear was used and cited by the Committee as ample evidence that the area could support 200 wild horses without any danger of “starvation” or causing rangeland damage that would effect other wildlife in the area. If an objective examination of range conditions was conducted by independent outside sources forty years ago, which found 200 wild horses were making little to no impact on the Pryor Mountain range conditions, why are the same number of 200 wild horses today making such a big impact now? 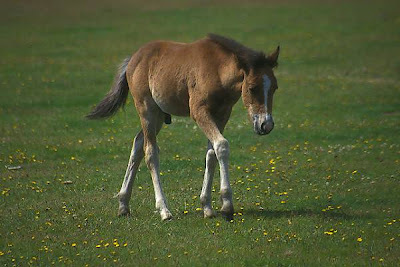 And if those same independent reviews determined the damage had already been done a century ago, how will the Pryor Mountain wild horses EVER be free from the continued claims by BLM and other vested interests that, “current photos showing degraded rangelands are being caused by "excessive" wild horses"? of the Pryor Mountain wild horses! Yes, gathers, gathers, everywhere. It’s for their own good, you know. To prevent them from starving and dying and destroying the range and oh yes, just plain being EXCESSIVE! It’s much safer and more humane than letting them starve, as the drumbeat goes, and BLM publicly reports only a mere fraction of deaths and injuries result from this controlled chaos. But like everything else in the Wild Horse & Burro Program, the closely guarded facts and statistics often fail to add up or support BLMs claims as they continue to lean almost exclusively on what amounts to little more than a public relations campaign in order to hide its darker reality. In case you are wondering what a “gather” looks like, check out this new video of last years round up of the Sandwash wild horses in Colorado created by professionally wildlife photographer Carol Walker of Living Images and Wild Hoofbeats-America's Vanishing Horses blog. While snapping photos of piled up bodies, witnesses usually find experts claiming what their photos reveal have been fabricated, exaggerated or sometimes, they even go so far to suggest it never happened at all. Apparently, in today’s world, a picture is NOT worth a thousand words as the thousand words used to describe them by those overseeing the operations focus solely on convincing everyone “Everything is A-O.K. !”, no matter what your eyes may be telling you! BLM removed wild burros in Nevadas Gold Butte Herd Management Area twice in one year; once in March of 2006 and again in March of 2007. According to a 2007 Wild Horse & Burro Capture Status Report obtained via a Freedom of Information Act request by American Horse Defense Fund, 12% of the burros rounded up in March of 2007 were dead within six months of the gather. That’s a far cry from the 1-2% BLM is so fond of sharing with the public. With BLM providing little to no answers about continuing public concerns regarding maximum running distances, miscarriages and spontaneous abortions, hoof wear, lung tear, capture mypopathy or impacts from helicopter driving on various age classes with respect to wild horses, what hope is there of getting any answers to these same questions when it comes to the little burros? Oh by the way, the 12% mortality rate wasn’t the only interesting statistic to be found regarding BLMs record keeping of the Gold Butte burros. According to BLMs 2006 Gather Schedule, only 132 burros were reported to the public as having been removed. Yet, according to the FOIA’s Capture Status records, 152 wild burros were found listed as removed instead – 20 more burros than the Gather Schedule was reporting. When it came to the 2007 round-up records, things got a whole lot messier still…..
* The 2007 Gather Schedule reported 149 burros were captured and removed. * The Las Vegas Field Office Post-Gather Report reported 140 burros were captured and removed. * In the Wild Horse & Burro Capture Status Records, only 135 burros could be accounted for, either through adoption, sales, holding or death. Furthermore, the Las Vegas Field Office reported zero deaths on the Post-Gather Report while the Capture Status records reported one burro died during the gather that apparently has “disappeared” from the Las Vegas Field Office’s records. And the deaths didn’t stop there….Fifteen more were found in the Capture Status records to have either died or were euthanized at BLM CA Holding Facilities between April 10 and April 22 – less than one month after being driven by the helicopters to the capture pens. Currently, BLM has scheduled a legally required Public Hearing on the Use of Helicopters to continue driving California’s pitiful handful of “excessive” burros to the capture pens as well. California was once home to the largest wild burro population in America. Through a long progression of rotating DOI Secretaries charged by Congress to protect our wild horses and burros and the critical habitat they need to survive, they have allowed, approved, authorized, overseen and officiated over what was often a brutal demise instead. Turning a blind eye to “direct reduction programs”, (a.k.a., shooting these federally protected animals unless advocates could intervene) of once protected burros implemented by National Park Service or military installations, they have sat silently by as authorized officers fenced water sources or designed land use plans that removed habitat from Herd Management Areas containing critical water sources (such as the recently approved land use plans in Arizona, which removed all the land around the Colorado River from the HMAs – a stunt they learned from managers who yanked all the acreage around Lake Mead from its Herd Management status as well). Of course, these are just steps leading toward the final goal of “zeroing out” the herds completely. Anyone remember when former DOI Secretary Kempthorn just rolled his eyes and walked away from those begging for his intercession to allow volunteers to install a fully paid for water line to preserve one of Southern California’s last burro herds - and not just any herd either! Genetic tests revealed the Clark Mountain burros contained the most unique and “rare” genetic variants of any herd found throughout the West. But what did it matter to BLM or Secretary Kempthorne that they were the rarest herd on record or that a free water system was being offered off the backs of the American public in efforts pick up their slack and preserve what they are legally charged with protecting anyway? Today, the maximum burro population allowed on California public lands is “officially” 476 burros. I say officially because, as is so often the case with BLMs numbers, they are deceptive and misleading. While this is the official tally, BLM continues to report California’s AMLs as 98 burros higher than it really is due to the fact that two HMAs, Lee Flat and Piper Mountain, haven’t publicly reported a burro living there for years. So when you subtract the padded numbers from the real numbers, the actual number of true, allowed, maximum, “non-excessive” wild burros is merely 378 throughout the entire state. Then, if we add in the fact that BLM usually reduces this “maximum” population by at least 60% after the round ups (according to BLM, this is to allow for population expansion between removals), when the dust finally settles, the public can realistically expect about 150 burros to still be “free-roaming” on the range by the time BLM gets through with the round ups - that's for the entire state of California! * In Nevada’s Spring Mountain Complex round up, local news reporters at the scene confirmed wild burros being run straight down the chutes directly into the trailers – no sorting pen necessary. Film footage also captured a wrangler incessantly kicking a burro trying to turn around and escape the chaotic pile up of burros, as here again, too many burros were being jammed too fast down the chutes. * In the last California Clark Mountain burro gather, L.A. news crews filmed a helicopter flying so low, its skids clipped its target; one lone burro moving at a dead run that was sent sprawling to the ground in a cloud of dust and debris. * American Wild Horse Preservation Campaign was able to obtain a single photo slipped through by a concerned citizen revealing yet another accounting of brutal round up practices in their shocking expose, “Death of a Mojave Burro”. Here, an eyewitness exposed how yet another lone burro was run for miles via helicopter until it collapsed. If this weren’t enough, contractors then proceeded to jump up and down on the helpless burros rib cage and belly, grabbed its ears and repeatedly slammed its head into the ground until, finally satisfied, walked away to leave the burro to die a long and agonizing death. Click Here to learn more. BLMs Press Release announcing the removal of the California wild burros is vague and obscure at best. Legally, public hearings are required to obtain public input and comments in order for “public servants and stewards” to work together with the community in order to address concerns regarding official proposals. Public hearings on the use of helicopters and motorized vehicles to remove wild horses and burros are required by law, mainly due to the fact that there has never been a time when those who monitor the effects of helicopter driving on wild horses and burros have not expressed some very serious and real concerns about its humane results. But again we find BLM stretching the very limits of what is “legal”. This time, BLM carefully words the announcement by telling the public its only about what they have to tell you, not what you may want to tell them. If you have any questions, they are to be funneled through PR Specialists but don’t try to voice your concerns via mail, fax or email because, well, there’s no addresses provided! The meeting will be held on Wednesday, August 19th, 2009 at the BLM Barstow Field Office located at 2601 Barstow Road (California Route 247) in Barstow, California at 6:00 p.m. BLM burro specialists will explain BLMs plans to gather the burros as well as answer public questions. The planned gathers will also be available exclusively at the Barstow meeting, so everyone get their plane tickets in order and try to head out early from work to be there! For those of you who would like to respond in writing so that your comments and concerns will be included in the public record rather than have them disappear through one ear and out the other of the PR guys now in charge, here’s some additional contact information you can use. They also have a webmail form you can use by Clicking Here.